Sidorova is given a big confident sound-image well to the fore of the ensemble or orchestral; take "The Other Woman" as an example . . . The music sidles, slides and swoons -- femme fatale undiluted. Mind you there is a vein of lively boastful strut as well as in "À la bohémienne". Sidorova impresses, there's no doubt of that. 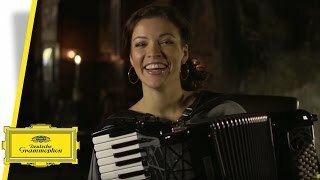 The inherent wheeze of the instrument is controlled and indulged in quite a breath-taking way and when a steady note production is needed it is forthcoming almost as if the accordion is emulating a violin ("Chanson bohème").
. . . a virtuoso accordionist . . . hugely enjoyable and very entertaining . . . Sidorova has a formidable technique, while the arrangements are witty, fun, and idiomatic. It all works very well and the recording is bright, forward, and immediate, with clean sharp detail and crisp dynamics. Ksenija Sidorovas Reise durch das musikalische Zauberreich der spanischen Motive entführt in eine ganz neue Welt - auch dank der raffinierten Einbettung des Akkordeons in fantasievolle Arrangements mit Einsprengseln im stilistischen Spannungsfeld zwischen Westeuropa und Orient, umgesetzt vom Borusan Istanbul Philharmonic Orchestra, dem Ensemble Nuevo Mundo und vielen Solisten. Ein Glücksfall für die Klassik. So präsentiert Sidorova, souveräne Beherrscherin ihres Instruments, Carmen mit Nuevo mundo und dem Borusan Istanbul Philharmonic Orchestra lockend und draufgängerisch, melancholisch, innig und arios. Countless artists, authors and other sharp creative minds – from Manet and Peter Brook to Nabokov and Nietzsche – have drawn deep inspiration from Carmen. Ksenija Sidorova is the latest to reimagine the tragic heroine of Bizet’s opera.